Thursday night was chock-full of politically relevant events in Memphis and Shelby County. Among them were two fundraisers — one at Wiseacre Brewery for the non-profit group Protect Our Aquifer and another at Sweet Grass for SCS board candidate Liz Rincon. (l) Ward Archer of Protect Our Aquifer displays some of the sand particles which, at several deep layers (this sample from 400 feet down) filter the near-pristine drinking water enjoyed by Memphis and Shelby County; (r) Jenna Stonecypher and Linda Archer sell a T-shirt to the Sierra Club's Dennis Lynch. The shirt, bearing the non-profit group's logo, says, "Save Water/Drink Beer." Getting an early start for the 2018 Shelby County Schools board race is Liz Rincon, candidate for Position 1. 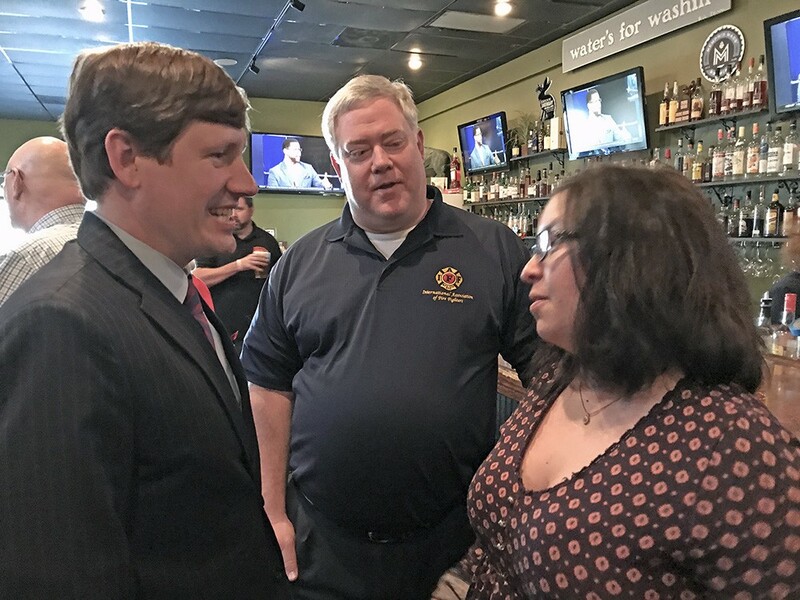 Here she speaks with two well-wishers — state Senator Brian Kelsey (l) and Fire Fighters Union official Joe Norman — at her Thursday night fundraiser at Sweet Grass.